2017 New-design difital stackable oven - China Foshan Nanhai Flamemax Catering Equipment Co., Ltd.
FLAMEMAX,a Chinese leading manufacturer in kitchen equipment. 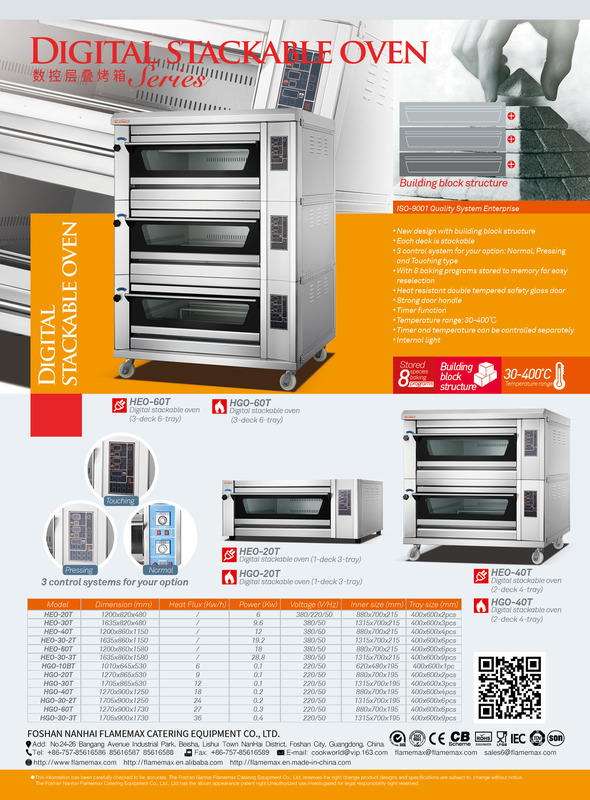 Although we are always highly acclaimed by our customer,we never stop knowing more about our customer and innovating.This time, we would like to launch our new digital stackable oven. * New design with building block structure. * Each deck is stackable. * 3 control system for your option: Normal, Pressing and Touch type. * With 8 baking programs stored to memory for easy reselection. * Heat resistant double tempered safety glass door strong door handle. * Timer and temperature can be controlled separately.